Michel Corneille was one of the founders of the Royal Academy of Painting and Sculpture in France in 1648. Members of the Academy embraced the humanist ideals of the Italian Renaissance and considered historical narratives—drawn from classical and biblical sources—the most elevated subject matter for art. 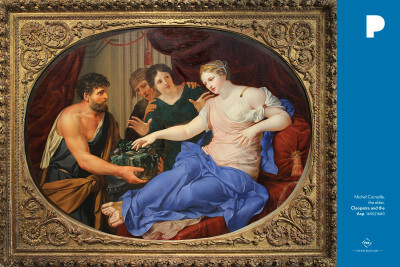 In keeping with these theories, Corneille used the story of Cleopatra’s suicide to illustrate a moral lesson. Cleopatra ruled Egypt from 48 to 31 BCE. She formed powerful alliances—political as well as romantic—with the Roman rulers Julius Caesar and, following Caesar’s death, Marc Anthony. When Cleopatra’s and Marc Anthony’s armies were ultimately defeated, Cleopatra preferred suicide to submission to the victorious Octavius. She chose a dramatic death—clasping a poisonous asp to her breast—that would make her the subject of artists through the ages. In Corneille’s version, she is depicted as a noble leader at the moment of choice between dishonor and death. Relating to ancient Greece and Rome, especially in the context of art, architecture, and literature. A revival or rebirth of cultural awareness and learning that took began in Italy in the fourteenth century and later spread throughout Europe, lasting through the sixteenth century. The period was characterized by a renewed interest in ancient Greek and Roman art and design and included an emphasis on human beings, their environment, science, and philosophy. Definitions adapted from ArtLex Art Dictionary and MOMA Glossary of Art Terms. Before reading the title or explanatory paragraph, describe the figures in this painting. Who are they? What are their relationships to each other? What do their physical features—clothing, coloring, postures—tell you about their identities? What do you think is happening in this scene? What is the mood of the scene? How has the artist built drama and tension into the story? What will happen next? Share anything you know about Cleopatra. Is this how you imagine her or have seen her portrayed in other artworks, films, or history books? What does Corneille’s representation of Cleopatra reveal about seventeenth-century French ideals of beauty, virtue, and nobility? Tableau activity for up to eight students: Position yourselves as a group to represent the various parts of the painting—figures as well as inanimate objects. One student can act as a director, helping others position their bodies at low (close to floor), middle, and higher points. Freeze the moment. Discuss new insights into the work. Repeat the tableau for the moment in time immediately following what the painting depicts. Freeze that moment, then discuss your choices.